"Generations in European Science and Society", in: H.A. Becker, and Johannes J.F. Schroots (eds), Releasing the Potentials of Senior Scholars & Scientists, Emerging Productivity in a new ERA, Utrecht (Igitur), pp. 51–80. "Fascinated by Progress in Sociology and Social Methodology" (autobiography), in: H.A. Becker, and Johannes J.F. Schroots (eds), Releasing the Potentials of Senior Scholars & Scientists, Emerging Productivity in a new ERA, Utrecht (Igitur), pp. 261-270. "Karl Mannheims "Problem der Generationen" - 80 Jahre danach", Zeitschrift für Familienforschung, vol. 20 (no. 2), pp. 203-221. "Validation – The Missing Link in Life Cycle Assessment, Towards pragmatic LCAs", The International Journal of Life Cycle Assessment, vol. 11 (no. 5), pp. 295-207. "Innovations in met-analysis and social impact analysis relevant for tech mining", Technological Forecasting and Social Change, vol. 73, pp. 966-980. "De Geschiedenis van de Sociologie", in: W. Koops, H. van Rinsum, and J. van Teunenbroek (red), De Sociale Wetenschappen in Utrecht, Hilversum (Verloren), pp. 227-250. "Is de tijd rijp voor een assertieve sociologie? ", Sociologische Gids, yr. 51 (no. 4), pp. 466-472. "Theory formation and application in social impact assessment", in: H.A. 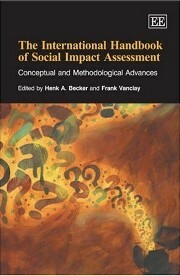 Becker, and F. Vanclay (eds), The International Handbook of Social Impact Assessment: Conceptual and Methodological Advances, Cheltenham (Edward Elgar), pp. 129-142. "Social Impact Assessment", European Journal of Operational Research, vol. 128, pp. 311-321. Utrechtse emeriti, een sociologische verkenning, Utrecht (Zuidam), pp. 1-100. Generaties en de strijd tegen taalbarrières, Utrecht (Studium Generale), pp. 1-43. 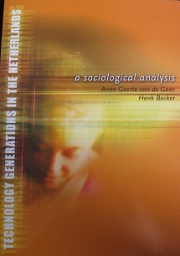 Technology Generations in The Netherlands, a Sociological Analysis, Maastricht (Shaker), pp. 1-146. "Discontinuous Change and Generational Contracts", in: S. Arber and C. Attias-Donfut (eds), The Myth of Generational Conflict, The Family and State in Ageing Societies, London (Routledge), pp. 114-132. "Social Research on Discontinuous Change", in: A. Kuijsten, H. de Gans, and H. de Feijter (eds), The Joy of Demography and Other Disciplines, Essays in Honour of Dirk van de Kaa, Amsterdam (Thela Thesis), pp. 409-420. Discontinue Veranderingen (Afscheidsrede Universiteit Utrecht), Amsterdam (Thela Thesis), pp. 1-42. 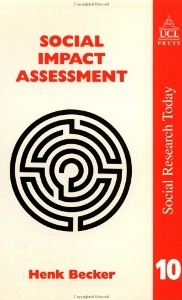 Social Impact Assessment: Method, and Experience in Europe, North America, and the Developing World, London (UCL Press). "Transitions into Independence: A Comparisation of Cohorts Born since 1930 in The Netherlands", European Sociological Review, vol. 13 (no. 2), pp. 117-137. "De Culturele Revolutie en haar effecten", Sociologische Gids, yr. 44, pp. 389-401. De toekomst van de Verloren Generatie, Amsterdam (Meulenhoff). "Generations, and Justice Over Time", Social Justice Research, vol. 9 (no. 2), pp. 185-198. "De demografie van ontgroening en vergrijzing", in J.A.M. Winnubst, M.J. Schabracq, J. Gerrichhauzen, and A. Kampermann, Arbeid, levensloop en gezondheid, Lemma, Utrecht, pp. 27-41. "Generations, and Value Change", in: R. de Moor, Values in Western Societies, Tilburg (Tilburg University Press), pp. 269-296. "Onderzoek naar generaties: Een reactie op Dekker en Ester", Acta Politica, yr. 30 (juli), pp. 351-354.